Australia’s government is saying that Twitter has bowed to political pressure in response to a tabloid media campaign against trolling and flaming on the service. A spokesperson for the Australian Communications Minister Stephen Conroy has told PBS MediaShift that following a teleconference this week between Twitter’s head of global public policy Colin Crowell, the Minister’s department, and the Australian Federal Police (AFP), Twitter has agreed to hand over users’ data directly to Australian police services in certain circumstances. That appears to include users’ data from outside of Australia if it pertains to threats to Australians. “There is a commitment in place from Twitter that they will be more responsive to police inquiries for issues involving imminent violent threats and possible self-harm,” he said. “In these circumstances…Twitter…has agreed to provide important metadata, which includes information such as user account names, time of messages, IP addresses to police. For imminent threats, police won’t have to go through the courts,” the spokesperson said. An AFP spokesperson has confirmed the Australian Government’s account: “The Twitter representatives stated they will now provide information directly to any Australian law enforcement Agency in cases of imminent violent threats, including threats of self-harm. Negotiations are ongoing,” she told PBS MediaShift. Additionally, the Communications Minister has told journalists that Twitter has agreed to preserve users’ metadata in ongoing trolling or bullying investigations of a less urgent nature, while a direct line of communication has been established between Twitter and the AFP. “This is an important step by Twitter and an acknowledgement that they cannot ignore legitimate inquiries for information,” Senator Conroy said in a statement given to me by his spokesperson. However, Twitter is maintaining that no changes have been made to its existing policies and procedures. Twitter’s policies do allow for emergency user information disclosure requests, however it is understood that these requests have been previously limited to U.S. law enforcement agencies. Twitter has failed to reply to PBS MediaShift requests for further clarity about the implied policy changes affecting Australian requests for Twitter users’ data. What began with justifiable public disgust at the appalling Twitter bullying of Australian TV personality Charlotte Dawson, who was repeatedly taunted by anonymous tweeters demanding that she commit suicide (Dawson was hospitalized after the #diecharlotte hashtag took its toll), escalated when a football player also copped abuse on the site. After receiving a repugnant @mention from an anonymous tweeter, which targeted his recently deceased mother, Robbie Farah tweeted at Australia’s Prime Minister demanding she intervene to “stop the trolls”. Ironically, Farah was later forced to apologize to the PM, when it was revealed that he had tweeted abuse about her last year, suggesting she be bought a noose for her 50th birthday. Responding to the Farer incident, the Australian Attorney General Nicola Roxon demanded that Twitter reveal the identities of “anonymous trolls.” And she promised to work with Australia’s state attorneys general to investigate tougher local regulation of Twitter. The Premier of the biggest Australian state, New South Wales, called on the Australian Federal Police (AFP) to investigate tweeters who’ve directed abuse at celebrities, as his Police Minister called for the replacement of trolls’ keyboards with handcuffs. It was probably inevitable (however misguided) that a tabloid newspaper would start a #stopthetrolls campaign in response, targeting Twitter and, specifically, its anonymous and pseudonymous users. 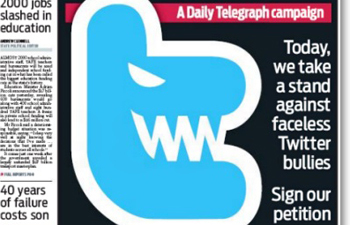 Murdoch’s high circulation Sydney tabloid the Daily Telegraph turned its obsession with the ‘evils’ of Twitter into a multi-platform campaign, which involved demanding that Australian politicians and law enforcers increase regulation and policing of Twitter and its users. With headlines like “Shine the light of justice on this evil”, “Finding the will to put trolls away”, “Going to war against the trolls” and “Jack’s (Dorsey) Tweeting us with disdain,” the ‘Daily Terrorgraph’ (as it’s satirically labeled by detractors for its penchant for fear-mongering) appeared to draw more mockery and derision than support from the Twittersphere and other online communities. At last count, despite two weeks of front page headlines, only 726 signatures had been collected on a Twitition in support of the #stopthetrolls campaign, while a Change.org petition had failed to reach critical mass. But despite the underwhelming online reaction, most political leaders were quick to overreact to the Telegraph’s call to arms, while Internet freedom advocates and academics (including me) urged caution. We did not want to see freedom of expression and media freedom trampled in the rush to regulate, and there are already ample legal protections – including the prospect of criminal charges – existing in Australia for cybercrimes such as online stalking, harassment, abuse and hate speech. We may preserve or disclose your information if we believe that it is reasonably necessary to comply with a law, regulation or legal request. Technical abuse and user abuse is not tolerated on Twitter.com, and will result in permanent suspension. 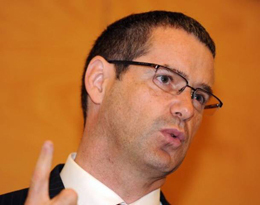 Regardless of these existing measures, Communications Minister Stephen Conroy gloated about bringing Twitter to heel, following this week’s hook-up with the company, which his spokesman said included agreement to do more to work with the Australian Government to inform consumers on how users can block others and how to make reports directly to Twitter. Can you imagine the workload for both the police and Twitter if every claim of Twitter trolling referred to the authorities is deemed to warrant investigation? Moreover, the implications for Internet privacy and freedom of expression may be significant if claims of a shift in Twitter’s data handover policy pertaining to Australia are correct. The bottom line: While online bullying and its potentially devastating consequences need to be taken seriously, and individual responses to such bullying should be validated in my view, the risks of lawmakers and law enforcers overreacting (to what some experts are arguing is a confected moral panic being whipped up by a tabloid newspaper) are very high in a country with no enshrined rights to freedom of expression. Do News Ltd & other campaigners against #twitter want laws to stop trolls to apply where twitterers could face death if revealed? 1) Does the Daily Telegraph not see how counter-productive it is to demand greater regulation and policing of Twitter while simultaneously campaigning for rejection of recommendations before government designed to bring the Murdoch press to heel in Australia? 2) What kind of social media strategy involves “flaming” a platform that can potentially deliver readers to content behind a pay wall? (Answer: Perhaps one that didn’t leverage social journalism expertise? The dedicated role of Social Media Editor at the Daily Telegraph was recently abolished). For his part, the lead journalist on the #Stopthetrolls campaign at the Daily Telegraph, Joe Hildebrand, told PBS MediaShift that he stands by his stories and that he is not at all concerned about the potential implications of #Stopthetrolls for online privacy or freedom of expression. So, if greater regulation and policing aren’t the best methods for dealing with online flaming and trolling, what is best practice? 4) Report the troll. Report to site administrators. 5) If they continue, contact the police. I’m not sure the second rule should be a blanket one. In some cases, calling out trolls via the medium of their choice and seeking your online community’s support can be a valid and useful response. But the rest of ACMA’s advice is very practical and helpful in my view. What do you think? Across all platforms, I’d argue that while existing laws should be enacted in cases of serious abuse (such as extreme cyberbullying and incitement to hatred or violence), there’s no need for new laws or regulations, nor tougher law enforcement — in Australia, at least. There is, however, a need to take the effects of online bullying and harrassment seriously. Part of that response should involve government support and funding for education in social media literacy and encouragement for social media users to practice effective self-regulation within their online communities. UPDATE (9/21/12 2:50 pm PT): The Australian Federal Police have confirmed that Twitter has agreed to hand over users’ data to Australian law enforcement agencies in serious trolling investigations — without a U.S. court order. Julie Posetti is an award-winning journalist and journalism academic who lectures in radio and television reporting at the University of Canberra, Australia. She’s been a national political correspondent, a news editor, a TV documentary reporter and presenter on radio and television with the Australian national broadcaster, the ABC. Her academic research centers on journalism and social media, on talk radio, public broadcasting, political reporting and broadcast coverage of Muslims post-9/11. She’s currently writing her PhD dissertion on ‘The Twitterisation of Journalism’ at the University of Wollongong. She blogs at Twitter.